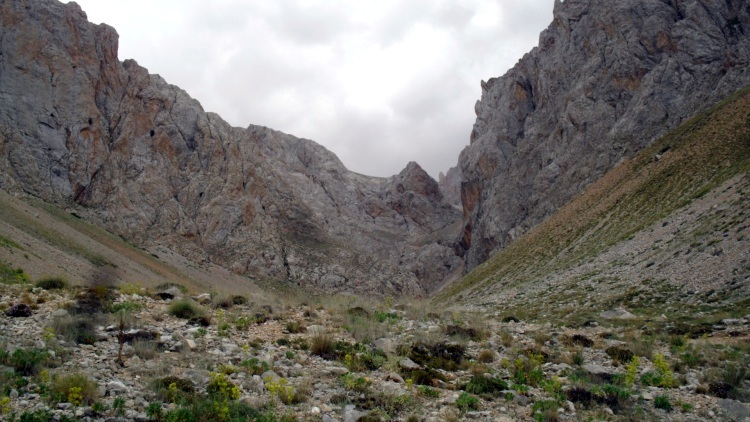 Remote trekking in the high, rough, limestone mountains of the central Taurus. A wide range of trails, from day walks to the beautiful two-day Yedigoller: Seven Lakes, to multi-day wonders. THIS PAGE IS AT AN EARLY STAGE OF DEVELOPMENT. PLEASE HELP US BY SENDING IN YOUR COMMENTS AND SUGGESTIONS! THANK YOU! A huge range of marvellous walks, from day walks to multi-day treks, in these rough, classic limestone mountains in the central Taurus range. The Pinarbasi village area is the most usual starting place. 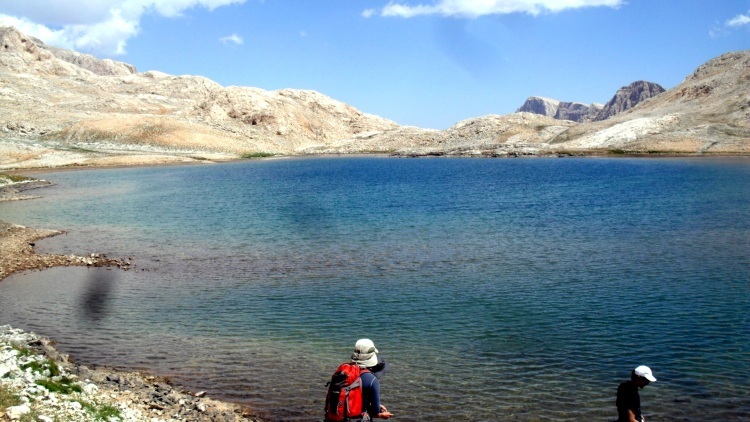 The best known walk here is Yedigoller, Seven Lakes: a demanding two day-plus trek to high, beautiful (you go it) lakes. 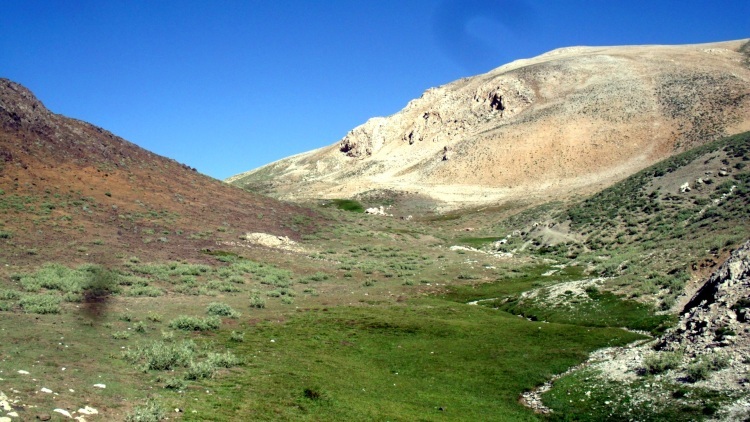 Alaca Plateau: high plateau of summer pasture surrounded by peaks and crags. Splendid views. Mt Emler: ascent of one of the central Taurus' highest peaks. Cimbar Canyon: descending a steep, spectacular canyon (can be walked as a circuit). Narpuz Valleys: high, beautiful valleys in the western flank of the Ala Daglar. 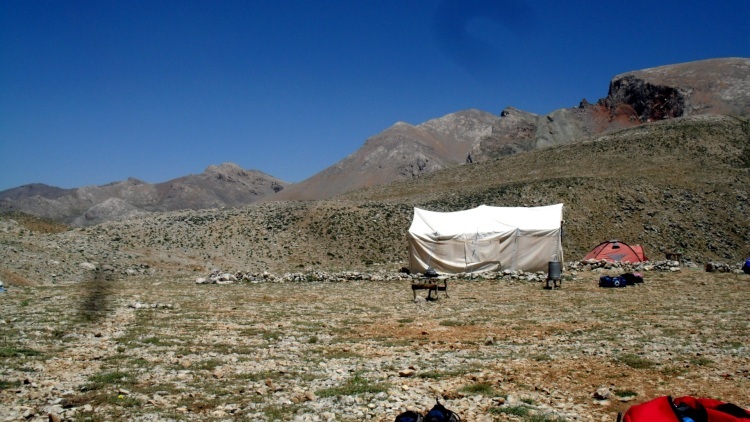 Eznevit Plateau: rough trekking up to the high plateau grasslands, with grand views. These can be combined into a classic circuit, as Walkopedia friend David Briese has done. See his accounts of the constituent walks on these pages (above). This is tough, remote mountain walking, so come prepared. Middle of June to end Sept recommended. You can walk on your own, but guided or part of a group is advisable unless you are experienced. See Lonely Planet: Turkey for some guide and expedition firm details. The park is accessed from Cappadocia, so walking here fits well with and would be a delightful variant on some Cappadocian exploration. There are plenty of expedition organisers who will take you on long walks through this area, often combined with days in Cappadocia. See in particular the expeditions offered by Explore. Thank you to Walkopedia Friend Mark Daley for his account of walking here. 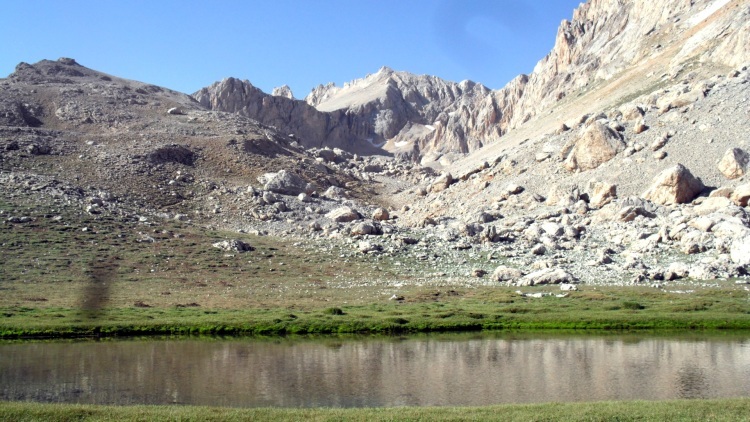 Please visit our Taurus Mountains page for detailed practical information on trekking here. The following is Mark Daley's piece on walking here. Thank you, Mark, for your contribution! 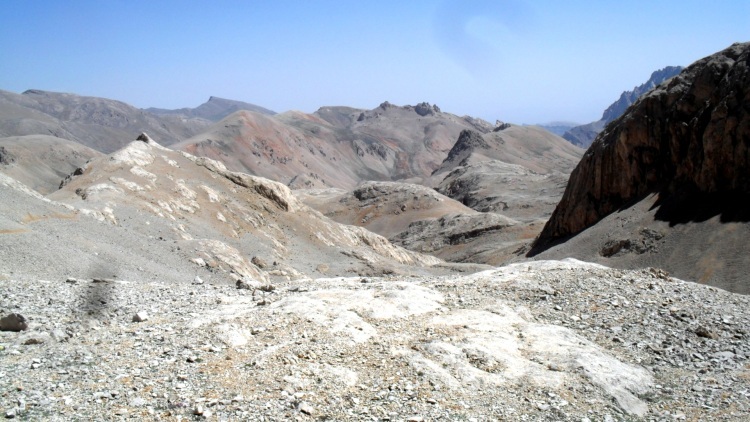 Southern Turkey's Taurus Mountains have many peaks in a range starting from 3,000m up to Mount Demirkazik's 3,756m. We visited them in July 2012 as an acclimatization and warm-up stage before moving on to Mount Ararat but discovered that they are far from being merely a supporting feature. The altitude means they have more flora, and are not so cold: you can wear shorts or at most a single fleece and light waterproof, and you are unlikely to have issues with thin air that exists higher up. 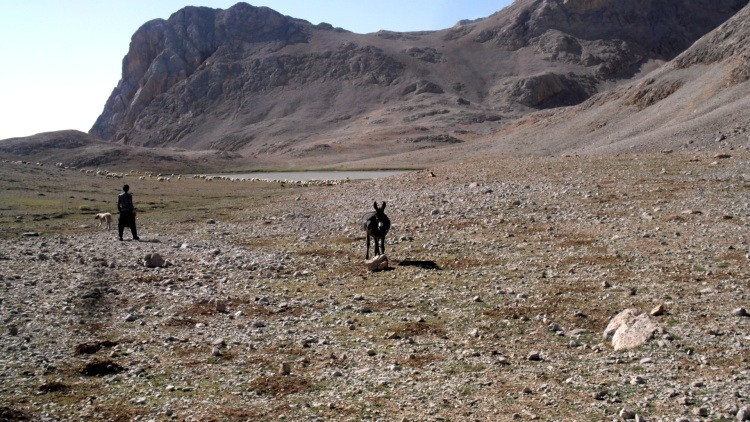 Although our route seems to be a common one, we usually seemed to have the region to ourselves, bar a few nomadic shepherds and muleteers who, and whose animals, could appear in the most unlikely spots. At other times you might be the only people in a hundred-square-mile area. Pinbasi village at 1,550m was the trailhead for a four-day trek which took us first into the Maden Valley, an easy ascent along a dirt road through scrubby deserted hillsides, to our first camp and a night of sleeping al fresco and watching shooting stars. The next day we trekked through the Aladag Mountains; some inspiring crags and gorges, orange, brown and white mountainsides and twisted limestone strata with innumerable cave openings high up, some presumably leading into cave systems still waiting to be explored for the first time. White, yellow, purple and blue Alpine flowers abound, together with some thistles and cacti. There are birds in the sky and rabbits (I hope so, or else they were large rats!) and marmots in the ground, mountain pastures and some peaceful alpine streams and lakes - we swam in one of them (Lake Karagol! ), along with thousands of curious tadpole-like creatures (or perhaps they were simply tadpoles...). We moved on through the Akcay Valley and after another camp scaled Mount Embler (3,723m), a non-technical climb with a little scrambling, enough to cause a small amount of lightheadedness among us as-yet-unseasoned climbers. The views from the top on a clear day are spectacular, stretching miles down and across the distant western plain. Much of the descent was through deep, loose scree which provided minutes of pure fun. If you have not done this before, the trick is to lean back a little, plant your heel in with a straight leg and let yourself slide into the scree... you gradually stop over the course of a yard or so when you do the same thing with the other leg. It's exhilarating, and just happens to be the most efficient way down (that's my argument anyway); and you will feel you have earned it. We continued though the Celkbuyduran Pass (3,450m), on the way passing the tented summer campsite of a nomadic family, living a life essentially little changed over 2,000 years - thought provoking stuff - and then dropped down through a landscape dominated by a greenish rock which I believe was serpentinite. The following morning we tackled the moderately challenging (in places) Cimbar Canyon, a long deep gorge where the sides seem to lean over you and trees grow improbably out of niches high above, with plenty of evidence of rockfalls. From the village at its foot we drove to Cayzeri to catch the overnight sleeper train to Erzerum (a comfortable option which allows you to see the interior of Turkey in style), and thence towards Ararat. 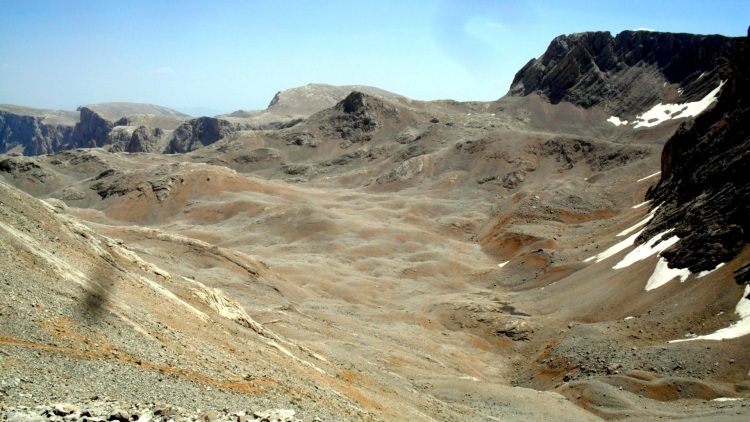 The Taurus Mountains are essentially deserted, relatively warm, spectacular in places, and neither so high nor so strenuous as Ararat. You can trek and chat at the same time, which is, after all, the essence of recreational trekking. Combined with a trip to Cappadocia (which is essential) and followed by Ararat (if you want), it is an excellent way to spend two weeks wholly away from civilisation.